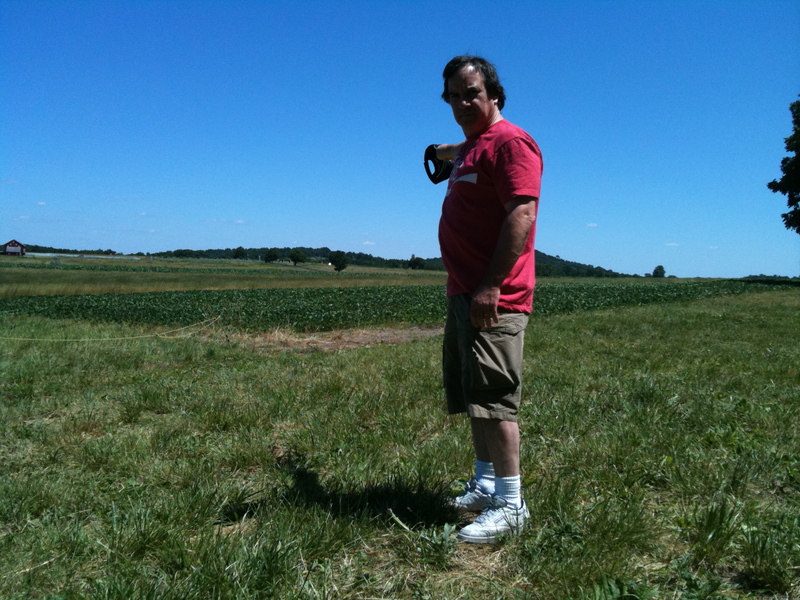 The Second Day at Gettysburg: 150 Years Ago Today | Paul's Voyage of Discovery & Etc. 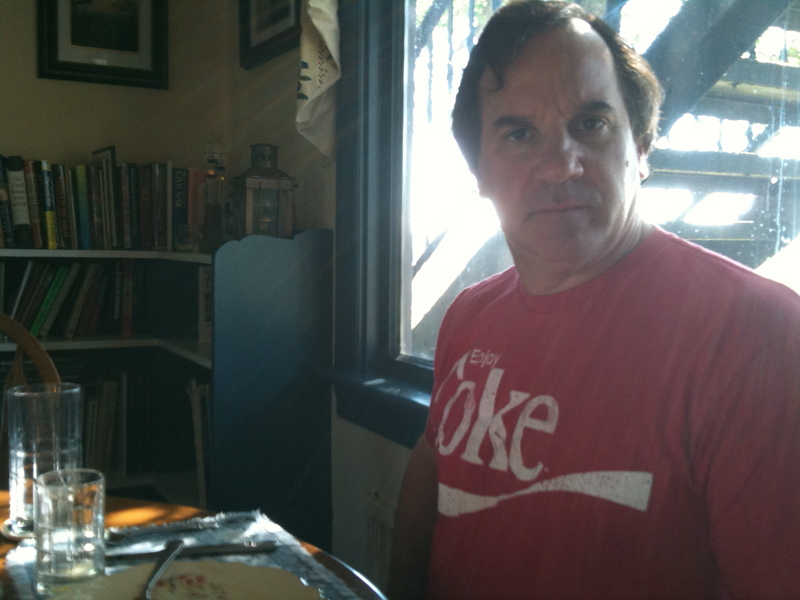 On the morning of July 2, as we enjoyed our communal Doubleday Inn breakfast of orange juice and a tasty vegetable, egg, and cheese dish, I was particularly excited about our agenda for the day. 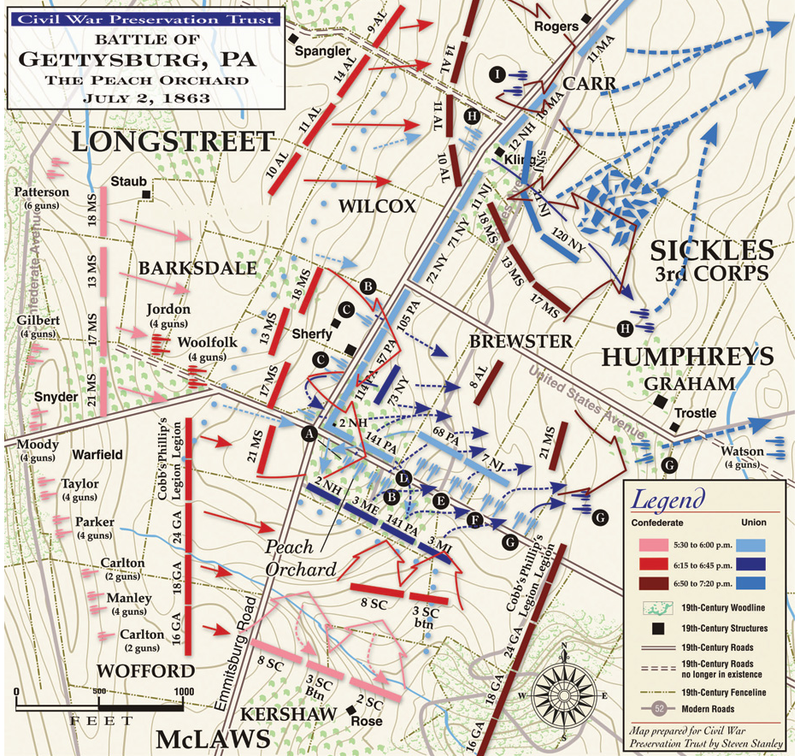 The plan was to experience the second day’s fighting at Gettysburg by assaulting the Union positions in the Peach Orchard and on Little Round Top from the perspective of Confederate General Longstreet’s attacking infantry. 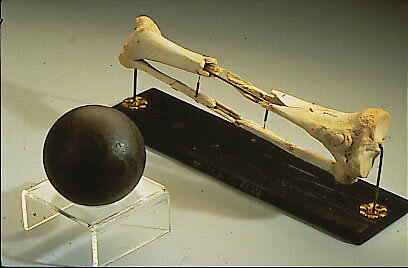 General Sickles, when he still had two legs. The second day at Gettysburg was a violent, chaotic stage on which many of our favorite Civil War characters played their most memorable roles, including Colonel Joshua Lawrence Chamberlain of the 20th Maine, Union Generals Winfield Scott Hancock, Dan Sickles (Vic’s offbeat romantic antihero), Gouverneur Warren, and Strong Vincent — plus Colonel Colvill’s First Minnesota Volunteers. Some of these guys would survive the day’s brutal fighting and some would not – and at least one would survive, though not in one piece. For the day’s campaign, Victoria and I armed ourselves with Joshua Chamberlain’s battle memoirThrough Blood & Fire at Gettysburg and the volume of Battles and Leaders of the Civil War covering the second day’s fighting at Gettysburg. Battles and Leaders was first published as a series of articles in “The Century” magazine between 1884 and 1887. The articles were penned by Union and Confederate officers with their own personal insights, reflections, and in some cases grievances, regarding the battles they fought and the enemies they contended with – both in the opposing army and their own. 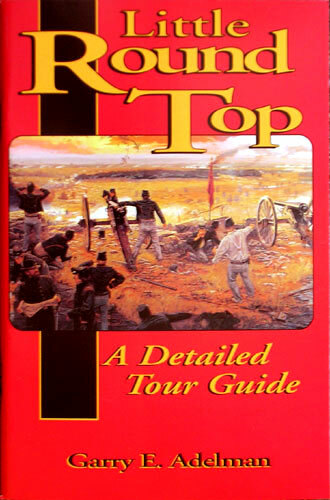 In addition, we carried a handy, little guide to the monuments and sites on Little Round Top. BTW – You can actually read any and all of Battles and Leaders on this link. 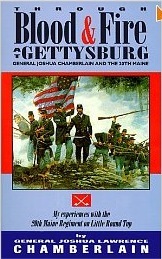 Articles on the second day at Gettysburg begin in Volume 3 on page 290. 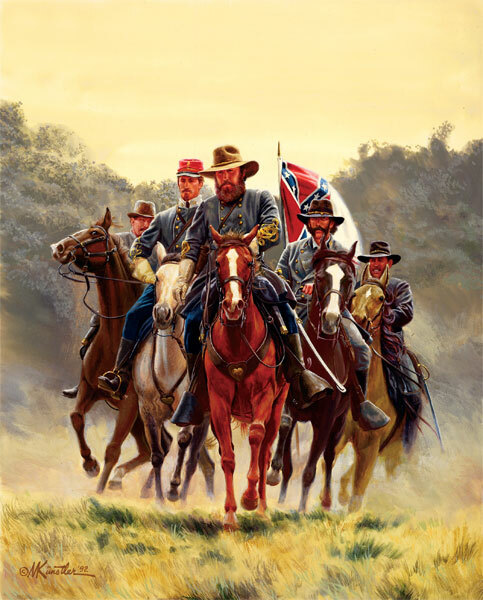 You may want to check out the article “Reply to General Longstreet” on page 355 to see how the battle was still being re-fought among veteran officers two decades after the guns fell silent at Gettysburg. Victoria and I left the Doubleday Inn and drove west along Seminary Ridge toward Longstreet’s position on the Confederate right wing, passing the positions held by the bulk of Lee’s army at the end of the battle’s first day. 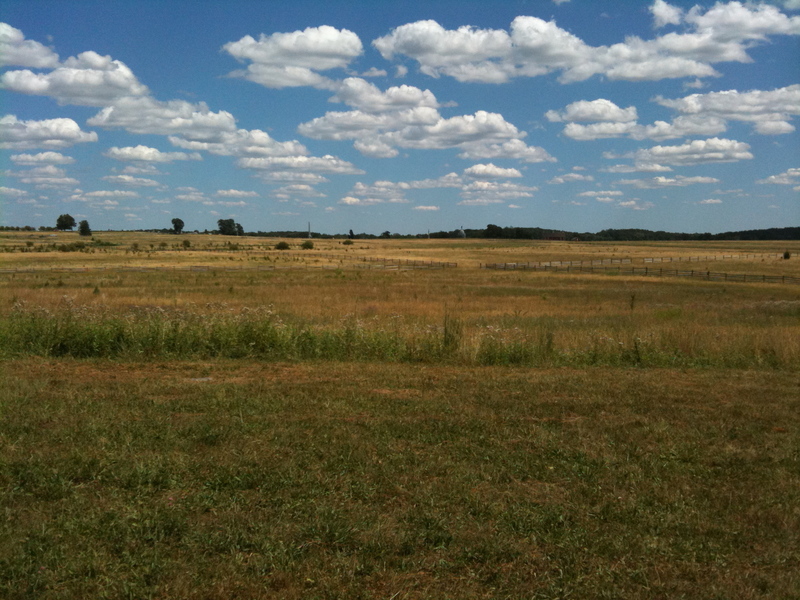 On July 1, 1863 the Union forces had been driven from Seminary Ridge to the higher ground on Cemetery Ridge, nearly a mile of flat, open farmland to the south. The two-lane road that runs along the Rebel lines, SW Confederate Avenue, is lined with vintage cannon marking each of the Army of Virginia’s artillery batteries, and monuments to all of the Southern states that fought at Gettysburg. Every state in the Confederacy, including far-off Texas, was represented in the ranks of Lee’s invading army. 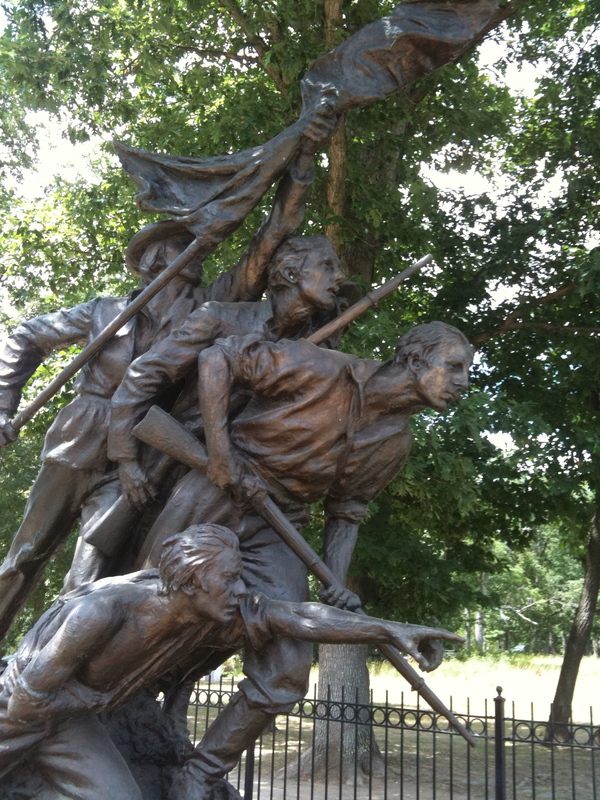 Of these monuments, the South Carolina monument is the most compelling, dedicated to the Southern state that had more soldiers – and more casualties at Gettysburg than any other. The huge, imposing monument to General Robert E. Lee shows how the South, quite literally, put Lee on a pedestal – and still does to this day. 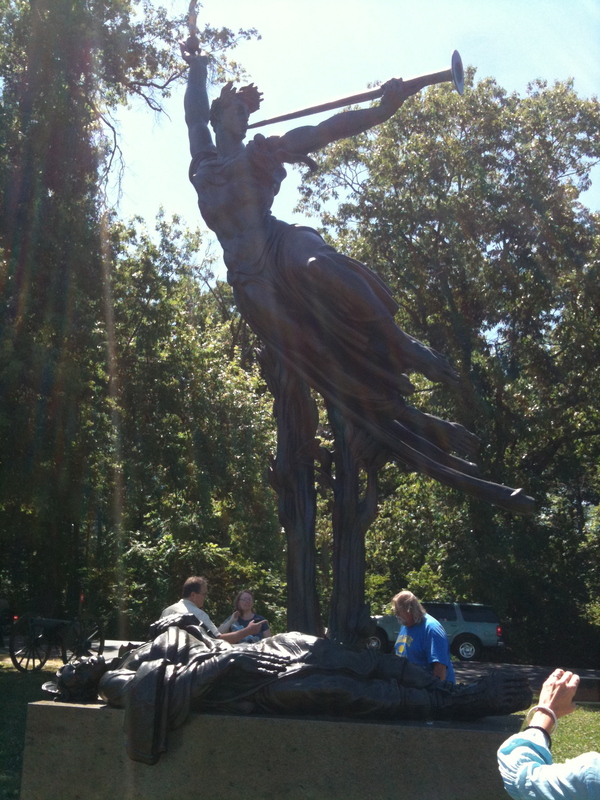 The Louisiana monument (below) is also dramatic: one of the very few to portray a fallen Rebel soldier. At the far right of the Confederate line, where General James Longstreet made his headquarters, stands the Longstreet monument. 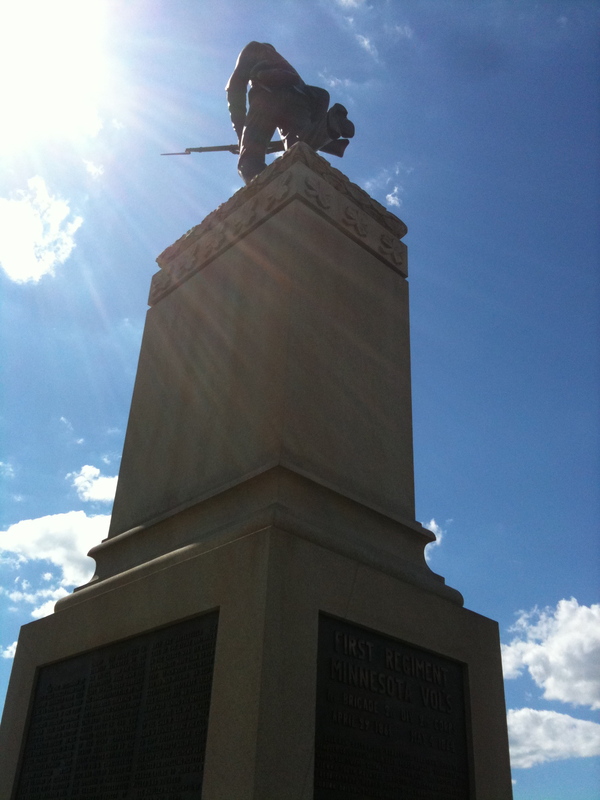 Sculpted by Gary Casteel and unveiled on July 3, 1998, Longstreet’s monument is not only one of the very last to be erected on the battlefield — it is striking for what it is not. It is not a grand or heroic memorial in the manner of all the other monuments dedicated to commanders of both sides. 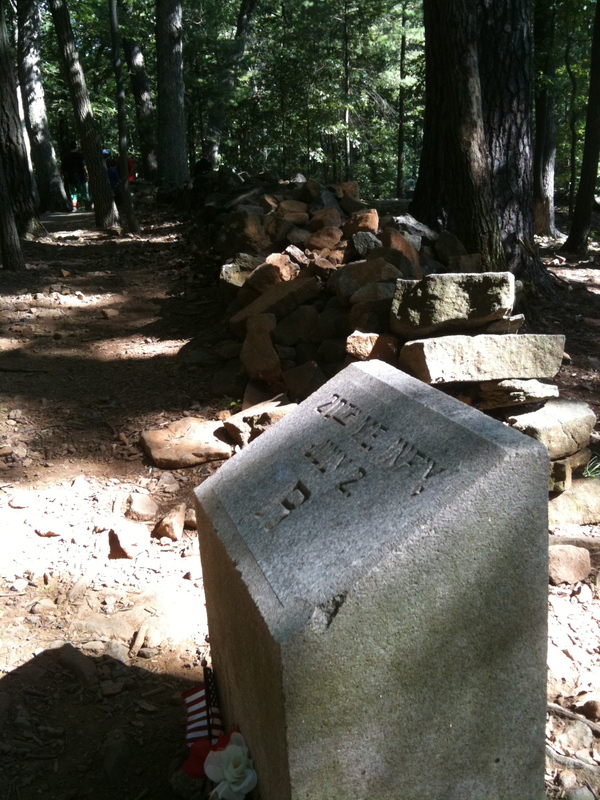 Longstreet is not placed on a pedestal, and he is practically hidden in Pitzer’s Woods. If you’re curious about why it took so long to honor Longstreet at Gettysburg – and why his memorial is so understated – I challenge you to explore the post-war controversy that arose over the man his troops called “Old Pete” and the soldier General Lee referred to affectionately as “my old War Horse.” This link will take you to an article that’s a fine start to such an exploration. 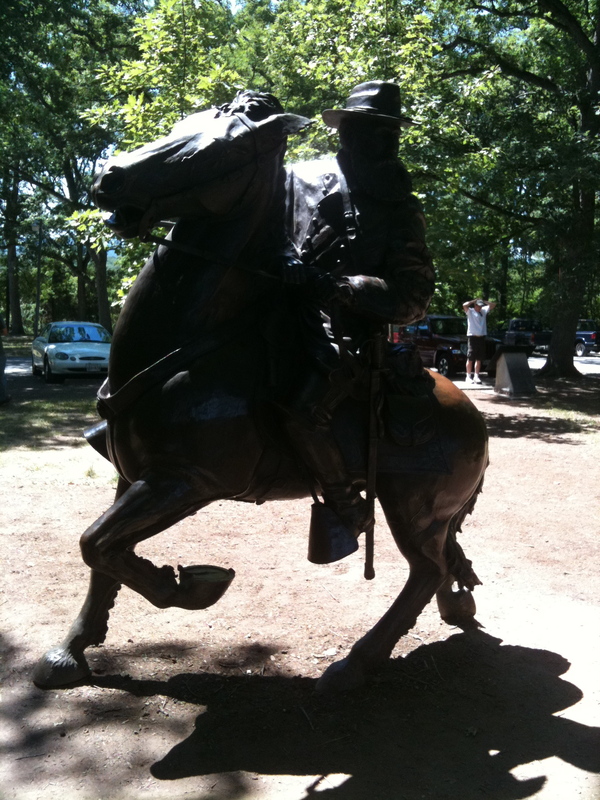 Longstreet’s statue stands in the eastern edge of Pitzer’s Woods, where the general reins in his favorite horse, “Hero” — as they both look across the fields toward the enemy. From this shady spot, Victoria and I began our own assault on the Union forces waiting for us across the sun-blasted farmland to the southeast – just as Old Pete’s corps did on July 2, 1863. Victoria, driven by motivations both historical and health-conscious, had decided that we should tramp the battlefield on foot. So we parked the car near Longstreet’s monument and stepped off into the knee-high wheat and weeds, books in hand, headed toward the rocky prominence of Little Round Top. Our objective: Little Round Top, across a mile of open killing ground. 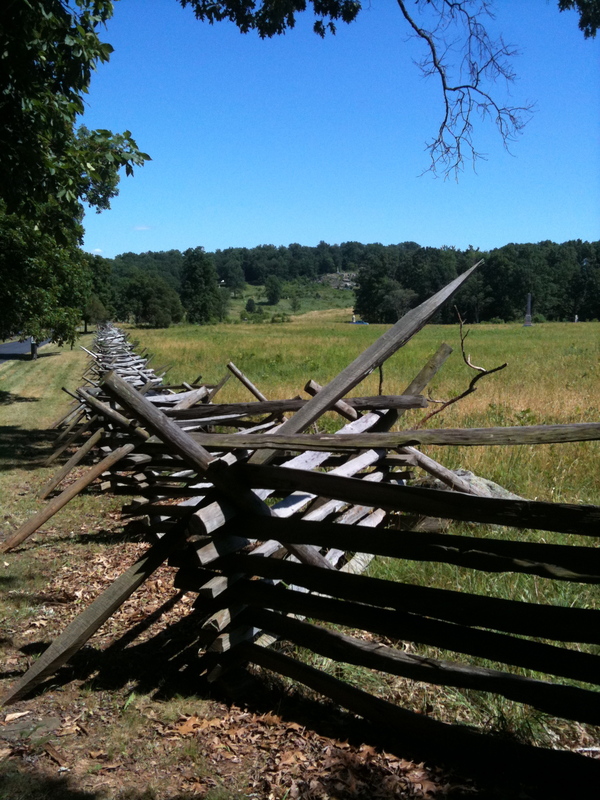 A little more than halfway across the wide swale between Seminary and Cemetery ridges runs the Emmitsburg Road (now interstate Route 15) – then as now, a fence-lined barrier across the battlefield. It was on the other side of this road that the Rebel advance ran into something unexpected: Union General Dan Sickles’ Third Corps, posted in a peach orchard. 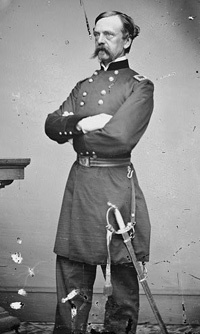 At the time, Sickles was the only Union corps commander without a West Point education. 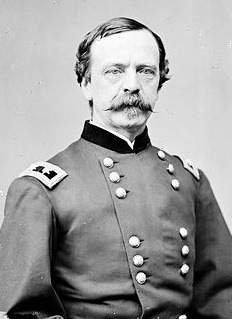 But while Dan Sickles was not a professional soldier, he was a born leader with great confidence in his own abilities. A pugnacious New Yorker, Sickles did not shy away from a fight. And he was about to have an epic one. 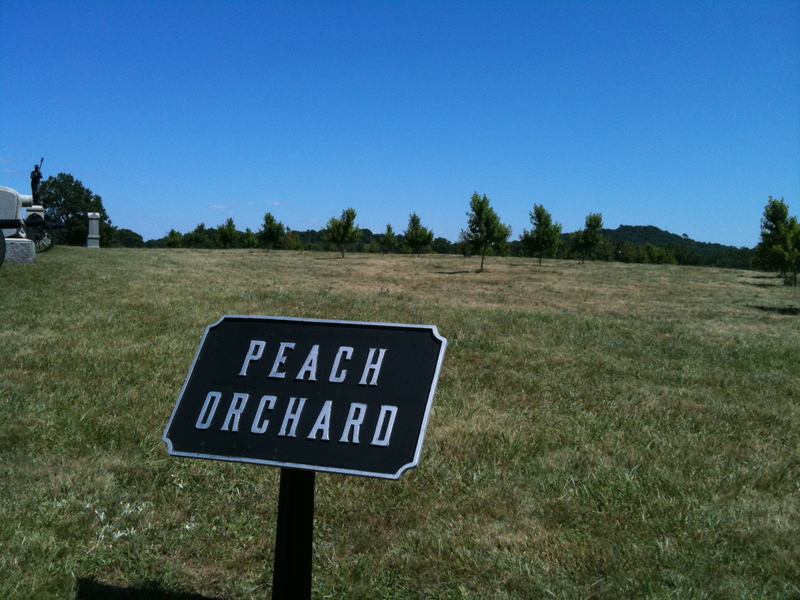 There are innumerable peach orchards in the United States, just as there were on July 2, 1863. But the stand of peach trees that Dan Sickles’ Third Corps defended from 4:00 to 6:30 PM that day would become known ever after as The Peach Orchard. How Dan Sickles’ troops came to be posted in The Peach Orchard is another longstanding Gettysburg cause célèbre. 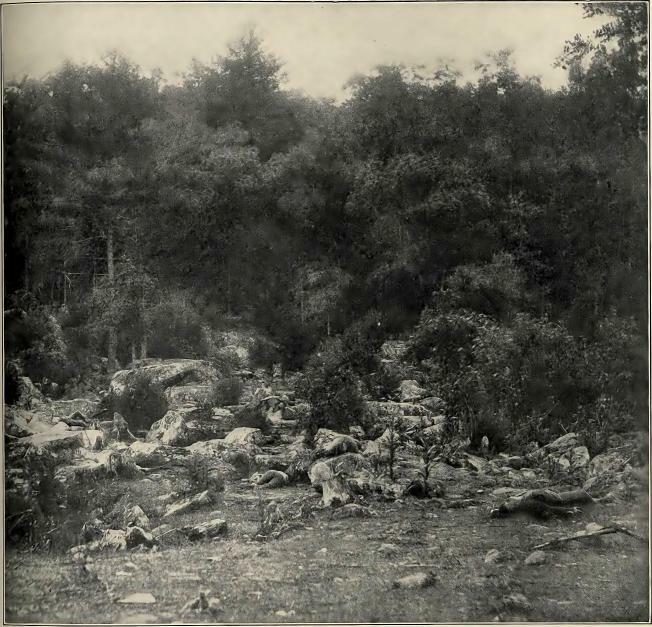 The commander of the Army of the Potomac, General George Meade, had ordered Sickles to align his right flank with the rest of the Union defensive line along the base of Cemetery Hill, with his left flank anchored on the rocks below Little Round Top. But, after looking over the terrain where Meade had placed his corps, Sickles had another idea. 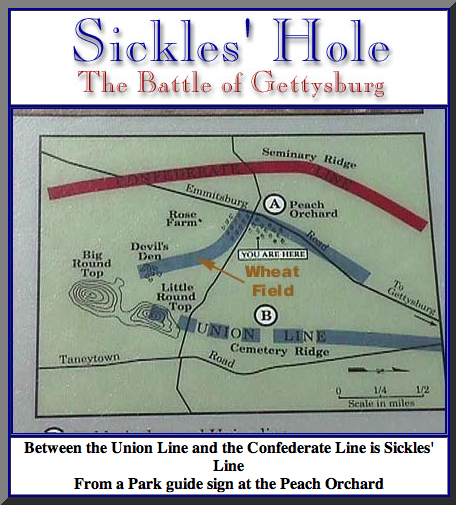 General Sickles could see that the ground rose in front of his position for half a mile until it reached an elevated ridgeline in that peach orchard along the Emmitsburg Road. Sickles was concerned that Rebel artillery might soon occupy that ridgeline — and rain down shot and shell on his position in “the hole” that Meade had placed him in along the base of Cemetery Ridge. So, Sickles took it upon himself to order his men forward to occupy the high ground in The Peach Orchard before Johnny Reb’s cannon got there first. Sickles’ initiative put his men on higher ground, but it also created a huge, exposed gap between his right flank and the rest of the Union line thousands of yards behind him – and between his left flank and the base of Little Round Top, which was virtually undefended. 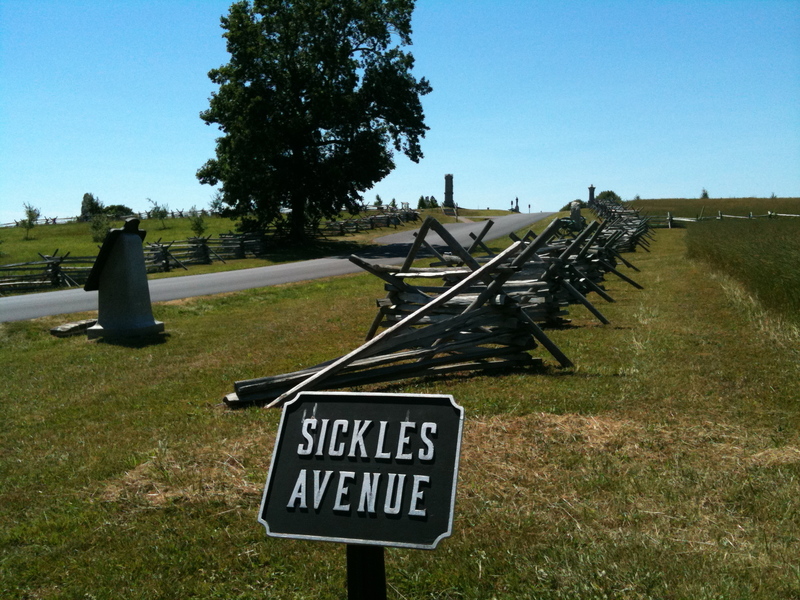 Sickles’ Third Corps now occupied an exposed salient, far in advance of any support or reinforcement from the Union rear: reinforcement they would soon need. After a deadly exchange of artillery fire in which both ends of Sickles’ salient got hammered, Longstreet’s infantry announced its assault with a Rebel yell. 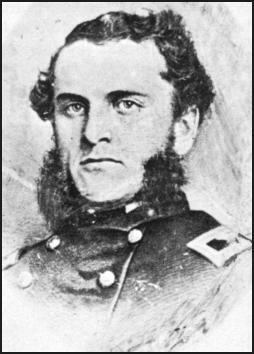 Confederate Brigadier General William Barksdale’s brigade of Mississippians smashed into Sickles’ center and Brigadier General Wofford’s Georgians hit him on his left. The fighting was fierce, but Sickles’ troops could not hold their line, and eventually fell back across the pulverized peach orchard. “Retreat by Recoil” by Don Troiani. 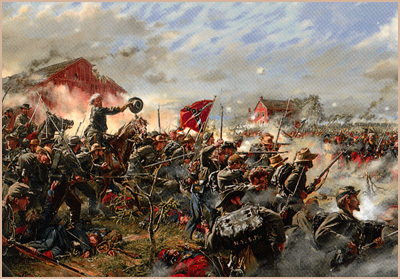 The 9th Massachusetts battery fights a heroic rear guard action against Barksdale’s brigade at Gettysburg. Where the Excelsior Brigade made their stand. 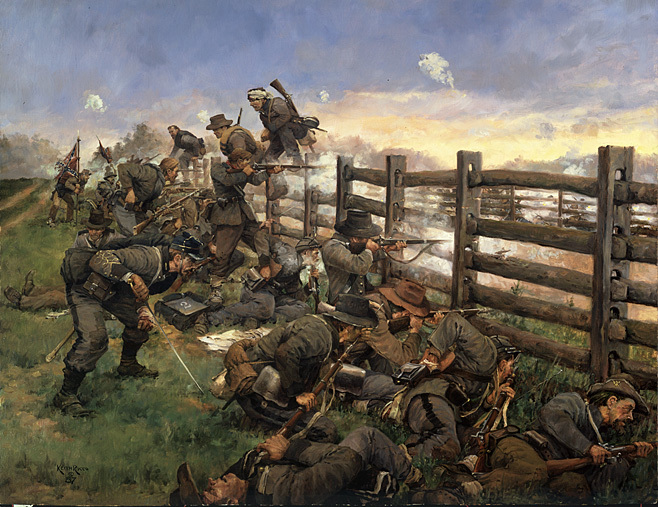 As Sickles’ line broke, the Thirds Corps’ Excelsior Brigade, made up of several New York regiments made their stand in the orchard and along the Emmitsburg road. Among them were The Second Fire Zouaves, a regiment of New York City volunteer firemen. Alas, the brave defense of the Excelsior Brigade could not stem the tide as the Rebels flooded the peach orchard, charging hard to exploit the wide gap in the Union lines caused by Sickles’ debacle. A painting by Don Troiani depicts the critical moment as troops from Sickles Corps retreat and a mounted General Hancock readies the First Minnesota to save the day. The collapse of Sickles’ salient created a rapidly developing crisis on the Union left. 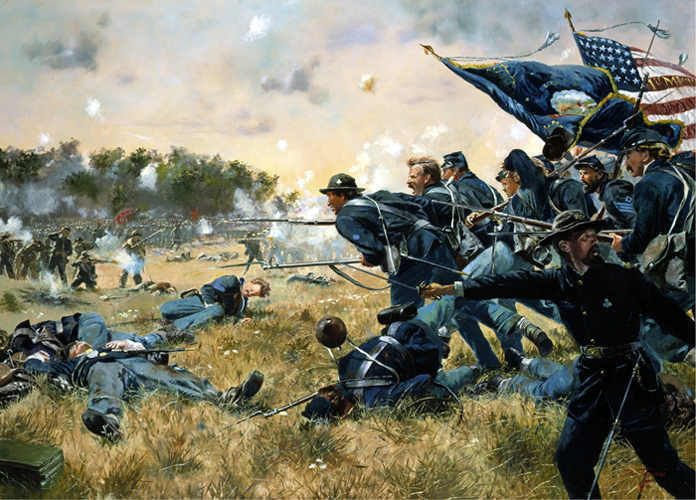 As the Confederates raced across the peach orchard in hot pursuit of the retreating remnants of the Union Third Corps, General Winfield Scott Hancock – in command of the Union center – knew that, in just a few minutes, the Rebels would charge through the gap and get behind his main defensive line. The day, the battle, and the war, could soon be lost. Hancock spurred his horse toward the crisis point and tried to rally Sickles’ retreating troops. But the few shell-shocked soldiers willing to reform their lines would not be enough. Hancock had called for reserves — but they’d never arrive in time. 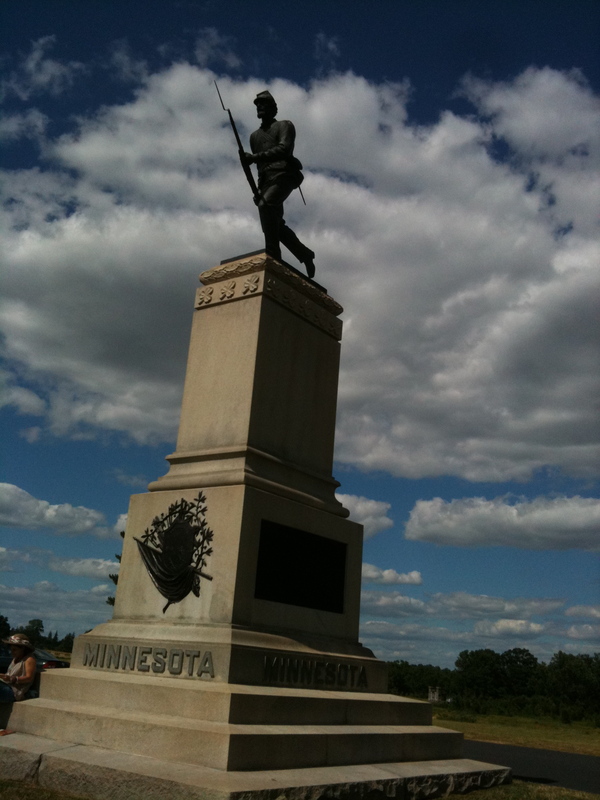 He needed something to plug the gap: that something turned out to be the First Minnesota Volunteer Infantry Regiment. Hancock, fate, and a band of stalwart men were about to meet their moment. “Every man realized in an instant what that order meant — death or wounds to us all, the sacrifice of the regiment to gain a few minutes’ time and save the position” recalled First Minnesota veteran Lt. William Lochren, “And every man saw and accepted the necessity for the sacrifice”. Imagine that scene. At such a moment, moral and physical courage are joined. The moral courage to give and obey such an order: the physical courage to make such a desperate, sacrificial charge. 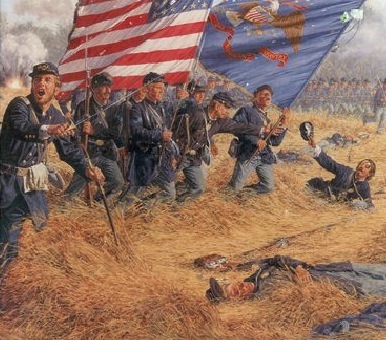 Led by Colvill, the 262 men and officers of The First Minnesota advanced on “the double quick” in line of battle, shouldering their muskets through a hail of lead as they bore down upon the center of the enemy’s line. Relentlessly, without pausing to fire, upon Colvill’s order to “Charge!” the Minnesotans ran toward their foe, leveling their bayonets. As the lines collided with a vicious shock, muskets blazed away and savage fighting raged hand-to hand. The First Minnesota’s flag fell five times — but it was taken up again each time. The Confederates were staggered by the First Minnesota’s fury and tenacity, and for 15 precious minutes, paid for in blood, the Rebel advance was stalled. 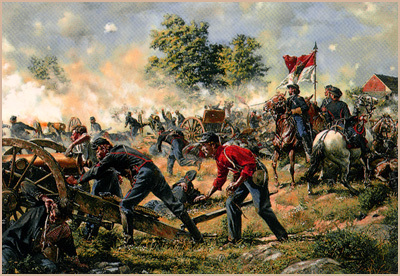 Ultimately, sheer force of numbers prevailed, and Colvill’s surviving troops fell back to the Union lines. 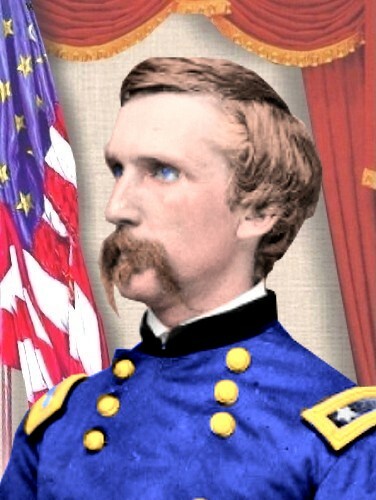 But by then, the men of The First Minnesota had bought Hancock the time he needed to plug reinforcements into the gap in the Union defenses. Of the 262 men who made that heroic charge, only 47 survivors rallied back to General Hancock: an 83% casualty rate that remains the greatest loss by any American military unit in a single battle. The regimental flag that was saved five times in that fateful fifteen minutes is now safely enshrined in the rotunda of the Minnesota Capitol building. Soon after the disastrous drama of Sickles’ debacle turned a peach orchard into The Peach Orchard, a nearby wheat field just a few thousand yards to the southwest was becoming The Wheat Field. 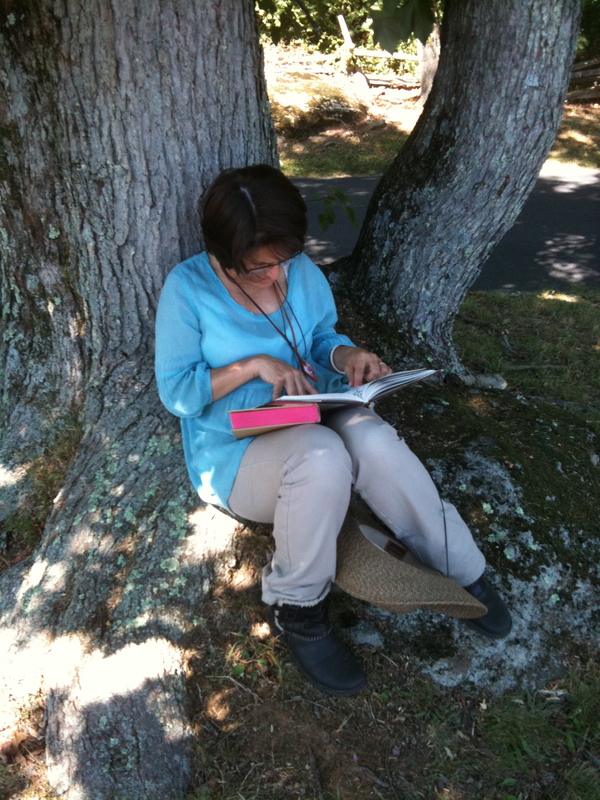 Victoria settled beneath a tree along the road overlooking The Wheat Field and read from Battles and Leaders. 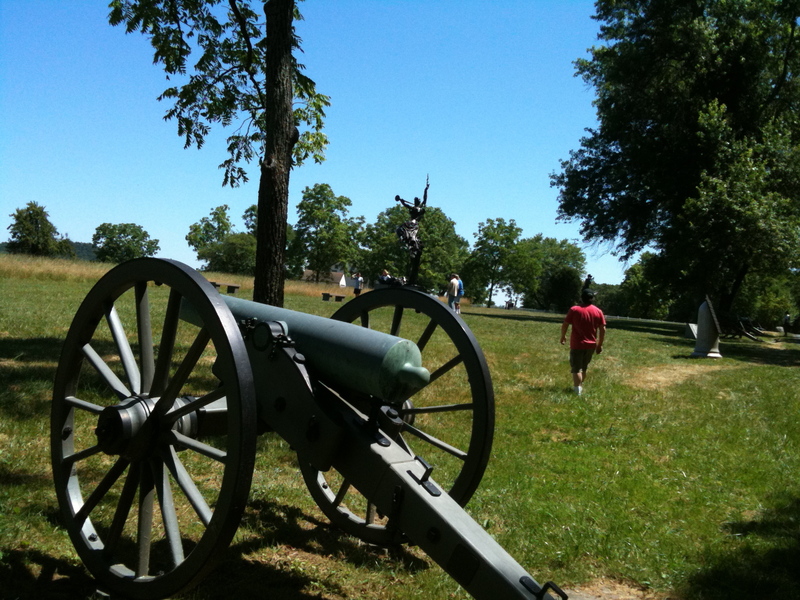 I didn’t know much about this part of the battle, but Victoria regaled me with the story of how a Confederate division of Longstreet’s Corps under General John Bell Hood was ordered to take the high ground of Little Round Top. 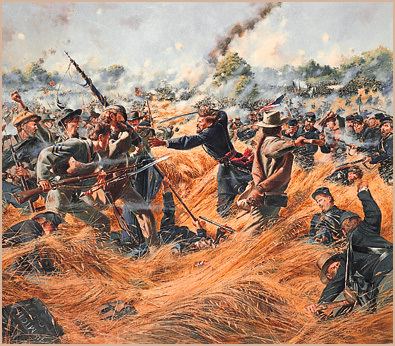 The fighting back and forth across the wheat field and nearby woods claimed more than 4,000 Union and Confederate casualties. Billy Yank and Johnny Reb traded possession of farmer George Rose’s 19 acres of bloodstained wheat six times – but the Rebels could not gain the high ground on Little Round Top. The now-silent, weed-choked acreage infamous as The Wheat Field was truly one of the deadliest patches of battlefield at Gettysburg. “Saving the flag” by Don Troiani. 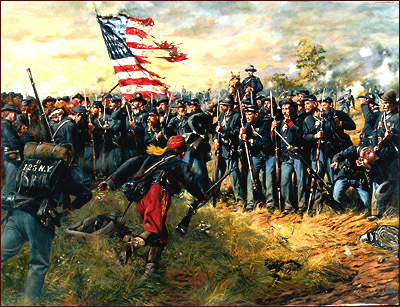 Colonel Jeffords of the 4th Michigan rescues the regiment’s flag in the wheatfield. I ran from monument to monument in that field, trying to take in the ebb and flow of the fighting. But I couldn’t dwell on The Wheat Field much longer. Like General Hood, our objective was Little Round Top. 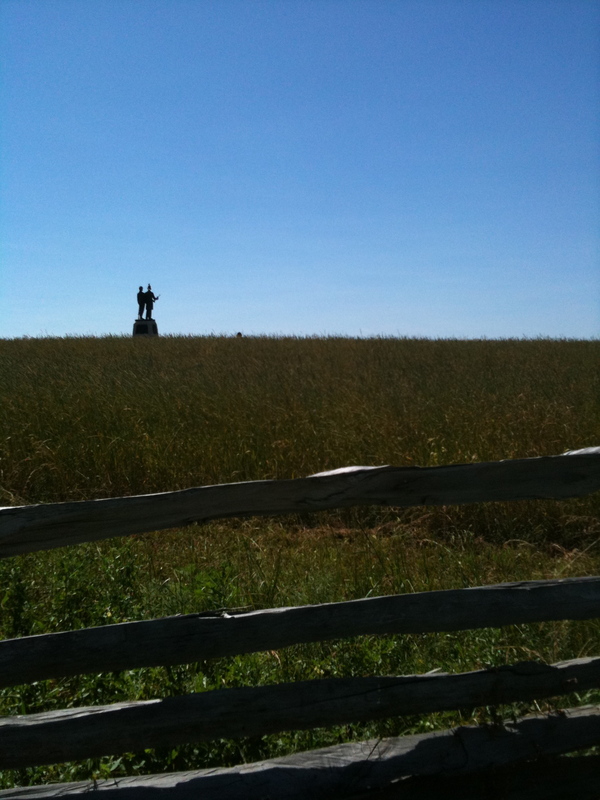 On the second day at Gettysburg, that rocky promontory, rising 650 feet above The Wheat Field, was the scene of the Civil War story closest to our hearts: the defense of Little Round Top by “The Fighting Professor” Joshua Lawrence Chamberlain and the volunteers of the 20th Maine. 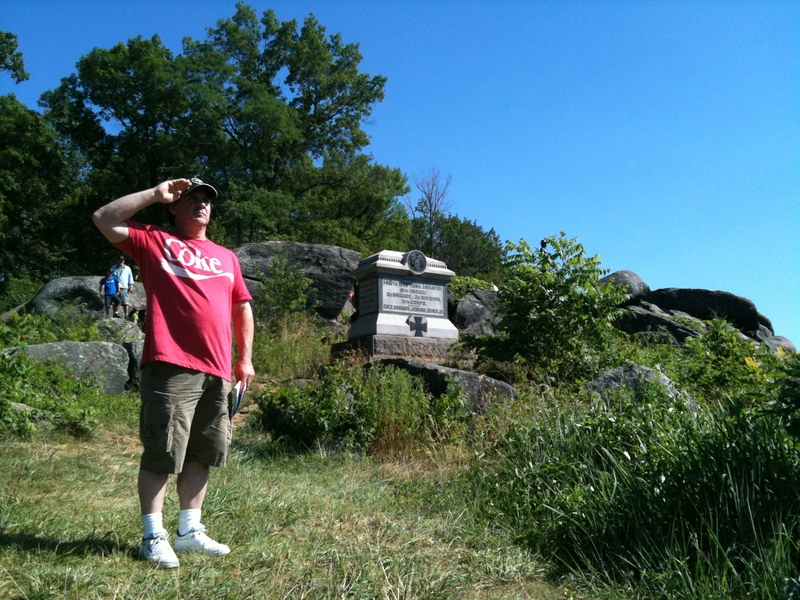 I begin our exploration of Little Round Top with a salute to those who fought there. Soon before the fights in The Peach Orchard and Wheat Field raged, Union General Gouvernor K. Warren, chief engineer of the Army of the Potomac, reconnoitered Little Round Top and noticed a Confederate battle line forming on the ridges beyond The Wheat Field. 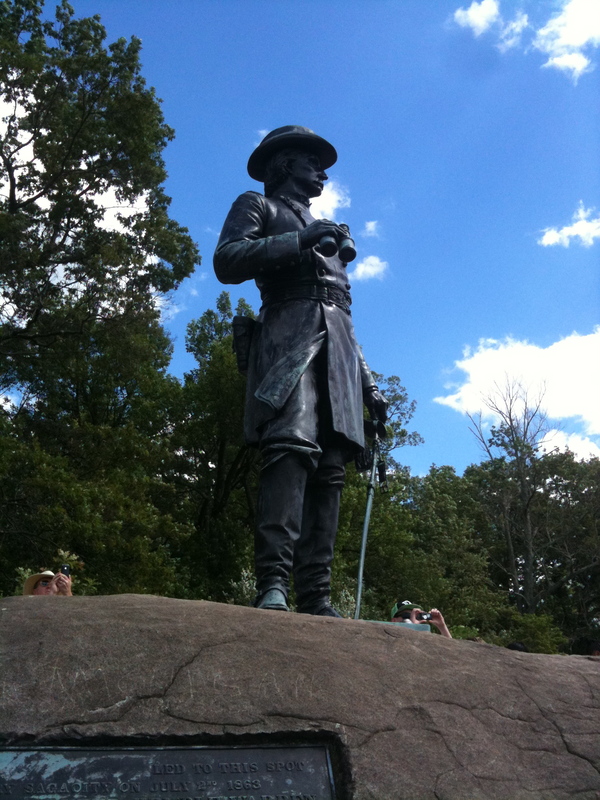 Seeing that Sickles’ ill-considered advance had left Little Round Top essentially undefended, Warren took it upon himself to protect the high ground. He didn’t have much time, sending couriers scrambling for units to help defend the hill. 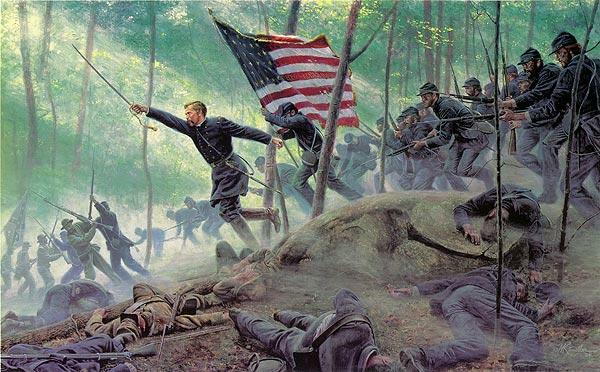 Not waiting for formal orders from his superiors, Vincent rushed to Little Round Top and placed the four regiments of his brigade in line on the extreme left of the Union army: the 16th Michigan, 44th New York, 83rd Pennsylvania, and Chamberlain’s 20th Maine. Soon after Vincent’s brigade took up their positions, the Confederate assault began — and Vincent, brandishing his wife’s riding crop, urged his men, “Don’t give an inch!” It wasn’t long before Strong Vincent fell, mortally wounded. Like General Warren, Vincent had done his part to save the Union left flank. 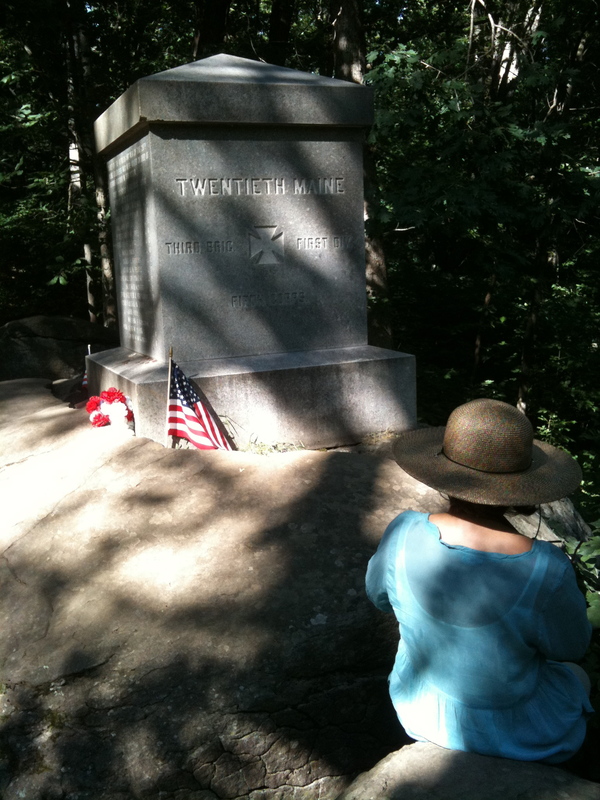 Now, it was up to Chamberlain’s 20th Maine to play their role in the deadly, decisive drama on Little Round Top. The right flank of the 20th Maine on Little Round Top. Victoria and I hiked up to the position defended by Chamberlain and the 385 men of his regiment. 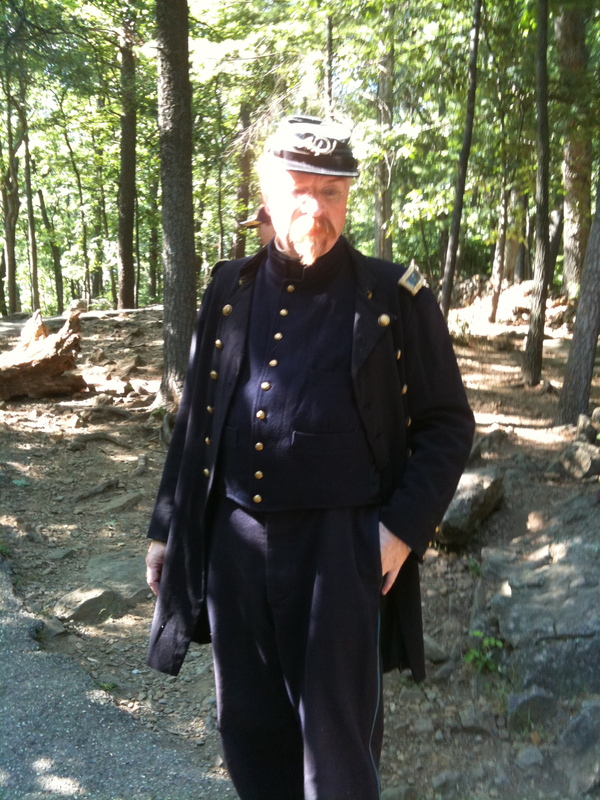 There, we found a Civil War re-enactor dressed as an infantryman in the 20th Maine. 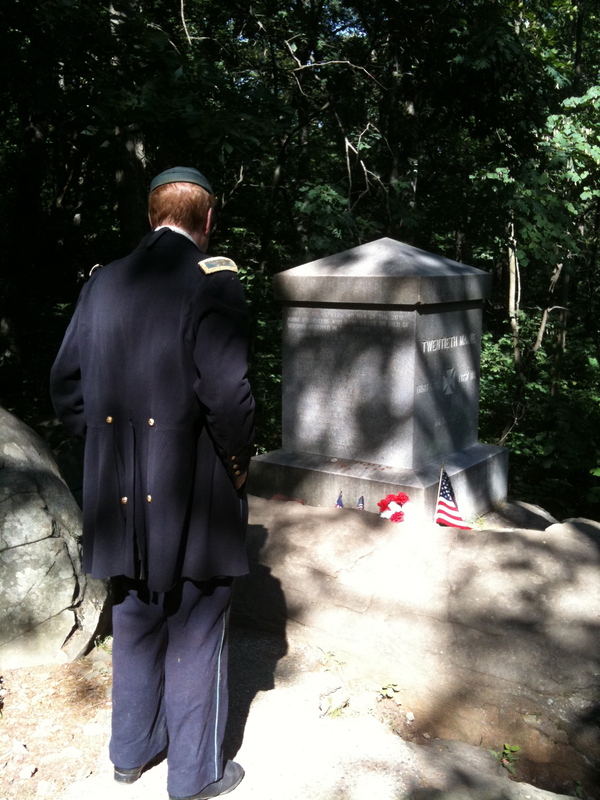 He knew the details of the battle pretty well, and I enjoyed sharing the story with him as we stood together on that hallowed ground where Little Round Top, the Union Army – and perhaps the nation – was saved. At about 6:30 PM, after once more repulsing an uphill attack by the 15th Alabama, Chamberlain’s troops were nearly out of ammunition. And they were running out of time. Longstreet’s Corps had failed to take Little Round Top – and Victoria and I had failed to take any water with us on our battlefield hike. So, a dehydrated Vic and I joined exhausted Johnny Reb as he retreated across the Gettysburg farm fields and regrouped for the fighting that would climax on the Third Day. 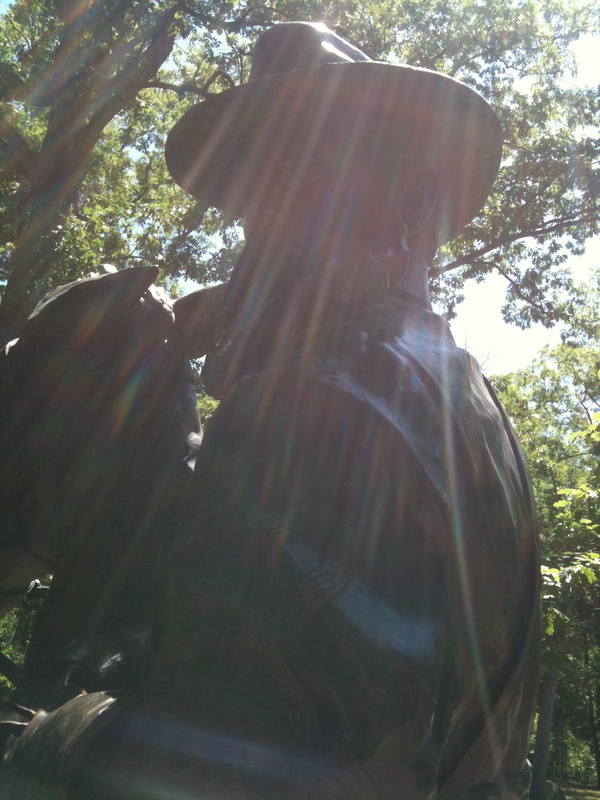 The sun was starting to set but it was still plenty hot as we tramped back down Little Round Top, through The Wheat Field, across The Peach Orchard, over the Emmitsburg Road, and all the way to Pitzer’s Woods, where General Longstreet and his warhorse defended our rental car.